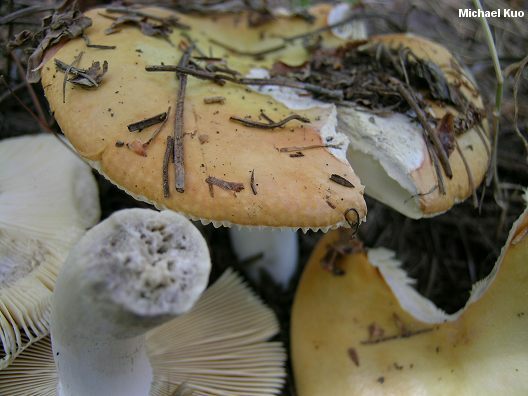 Among the blushing and blackening russulas, Russula decolorans is fairly distinctive: it has a dull orange to coppery orange cap, its flesh and stem bruise and discolor gray (without changing to reddish first), and it associates with conifers across the continent. Ecology: Mycorrhizal with conifers, often in bogs; growing alone, scattered, or gregariously; summer and fall; widely distributed in North America. Cap: 5-15 cm; round to convex when young, becoming broadly convex, flat with a central depression, or shallowly vase-shaped; sticky at first or when wet; smooth; usually coppery orange to dull orange but occasionally somewhat red, purple, or yellow; the margin lined by maturity; the skin not peeling easily. 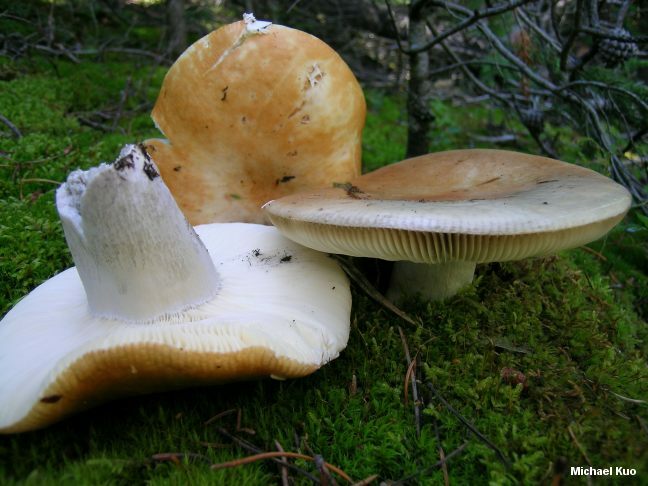 Gills: Attached or running very slightly down the stem; close; often forked at the base; white to cream at first, becoming yellowish; bruising and discoloring slowly gray. Stem: 4-12 cm long; 1-3 cm thick; white, turning gray with age or on handling; smooth; quite firm when young. Flesh: White; hard; staining slowly gray to black when sliced. Odor and Taste: Odor not distinctive; taste mild or slightly acrid in the gills. Chemical Reactions: KOH on cap surface yellow, erasing the orange pigments. 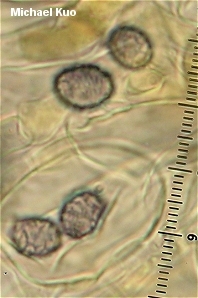 Microscopic Features: Spores 9-14 x 7-10 µ; elliptical; with isolated warts to 1.5 µ high; connectors scattered and few. 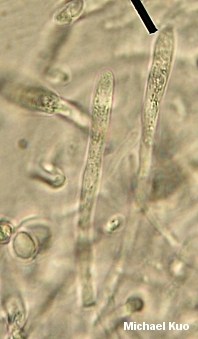 Pileipellis a cutis; pileocystidia abundant, cylindric to clavate, ochraceous-refractive in KOH and positive in sulphovanillin. REFERENCES: (Fries, 1821) Fries, 1838. (Saccardo, 1887; Burlingham, 1915; Beardslee, 1918; Kauffman, 1918; Smith, Smith & Weber, 1979; Arora, 1986; Kibby & Fatto, 1990; Phillips, 1991/2005; Evenson, 1997; Barron, 1999; McNeil, 2006.) Herb. Kuo 09120410, 09020605.